By Thomas F. Villeneuve, Robert V. Gunderson, Jr. This practical resource provides up-to-date coverage of how to structure and negotiate profitable corporate alliances, covering both the strategic benefits and potential risks involved in these complex arrangements. In clear and straightforward language, this handbook explains the proprietary rights issues involved and then walks the reader through the chronology of a deal, from the definition of objectives to the decision to seek an alliance, identification of potential partners, negotiations, and closing. 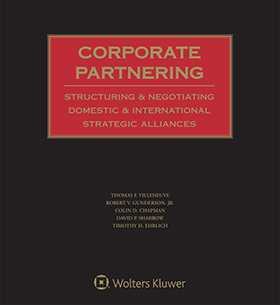 Corporate Partnering: Structuring and Negotiating Domestic and International Strategic Alliances, Fifth Edition is full of practical forms covering all aspects of strategic alliances annotated with crisp, clear commentary that explains the real-world issues addressed by each provision and how alternative solutions may be used to accomplish different aims. These carefully crafted agreements cover the broad range of areas from supply and distribution agreements, product and technology licenses, and research and development agreements to investment and investment-related arrangements. Thoroughly revised and updated to reflect the latest developments, the Fifth Edition includes new sections on Spin-Out Transactions, virtual companies, and off-shoring arrangements plus updated transaction forms, intellectual property summary, and partnering transactions checklists.